Regimental records indicate that Pvt. 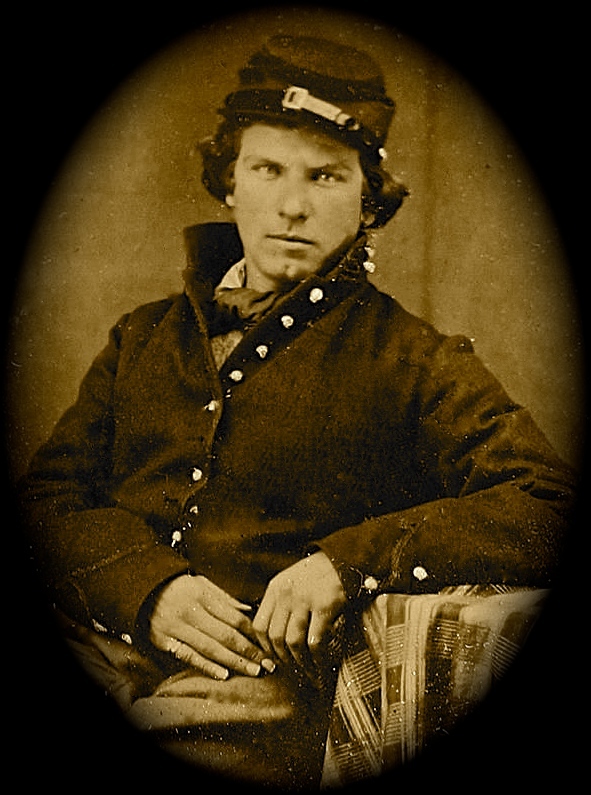 Boughton enlisted in 1 February 1864 at Middletown, New York. and was mustered into the service on 6 February 1864 for a three year term. He went missing in action at Reams Station on 29 June 1864. We learn from this letter he was with his unit again in early August 1864. He died of disease, however, on 15 October 1864 at Washington D.C. It is with much pleasure I sit down to answer your kind and welcome letter which I received the fifth of this month. The reason I have not answered before is because we have been marching. We have moved about ten miles from where we was before. I am with the regiment now. I am well. The boys is all well. We have nothing to do but to take care of our horses. The weather is very warm here. Harley, tell father to tell mister Tincrook that his boy is to City Point. I have not seen him but Peter Dimick ² was down there yesterday and seen him. It is about four miles to City Point from where I am. Harley, tell father I have been looking for a letter from him. Tell Avery to write me a good long letter. Tell him to write all the news. Tell mother we have very good living now. Tell her to see no trouble about me. Harley, I hope someday to see you and all the rest. If we are not permitted to meet in this world, I hope we shall meet in Heaven where parting will be no more. to Harley Boughton. Direct as before. Good bye for this time. Harley, send me another box of pills. Wrap them up in a paper. They will come all safe. Write soon. Write all the news. Good bye. ¹ There is no one by the name of Tincrook in the regiment (or any similar name). Perhaps the soldier was in another regiment; most likely from Middletown, New York. ² There is no one in the unit by the name of Peter Dimick. However, there is a Perez Dimmick who enlisted in February 1864 at Harpersfield as a private in Company D.
This entry was posted on Wednesday, June 18th, 2014 at 10:40 pm	and posted in Uncategorized. You can follow any responses to this entry through the RSS 2.0 feed. « 1864: N. C. S. to D. H. C.